MailChimp Lists prefer Subscriber Names to be separate fields: "First Name" and "Last Name"
Squarespace Forms, left unchanged, use a combined "Name" field. 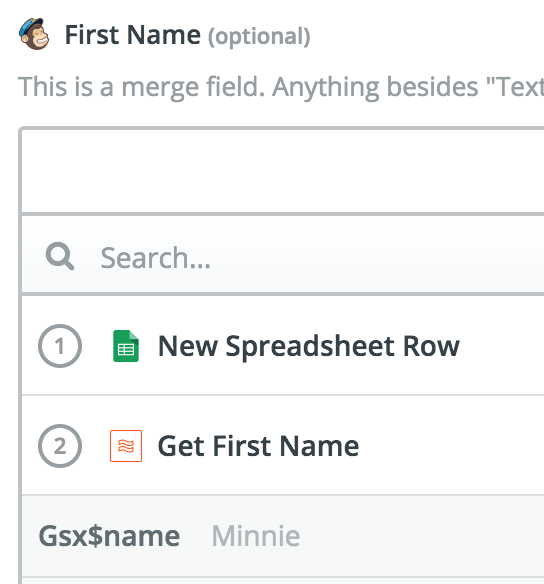 Using Formatter by Zapier, you can separate the "First" and "Last" name segments from the "Name" field, and assign them to the correct MailChimp fields. Inside of your Zap, placed before the MailChimp Action create a "Formatter" Action to grab the "First" name. Inside of the Formatter Action, use Transform:Split Text and set the Input to the "Name" field from Google Sheets. Leave the rest of the options at their default values. Create another "Formatter" Action, after the first, to grab the "Last" name. Then you can complete the Zap as you would normally. Pretty cool, right?